This beautiful watch is so classy looking that you'd never suspect it's also environmentally friendly. But this solar powered watch proves it can be done! 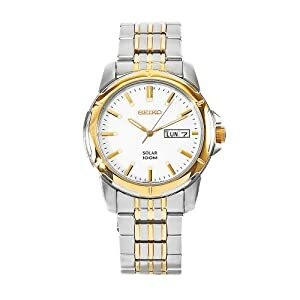 It has a two-tone stainless steel band that is silver colored with gold accents. The gold colored bezel surrounds the white dial. Gold hands and hour markers complete the crisp, clean look. Water resistance is rated at 100 meters (330 feet). Quartz movement keeps precise time over many months. The picture doesn’t show how stunning this watch is. It's truly a work of art.